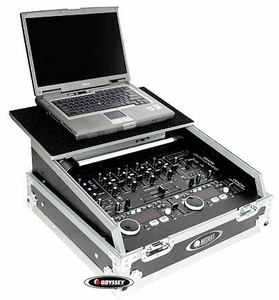 For DJs venturing out into the digital dj world of laptop DJing, this case is made just for you. Incorporating both an 8 space aligned mixer section and a track glide laptop platform all in one. Track glide platform slides forward during play revealing your mixer section and easily slides back for easy transport. Foam padded non-slip platform makes sure your laptop stays put during your performance. Patent pending. Note: The gliding laptop platform can be positioned as needed. For the safety of your equipment, please be aware that the platform can be removed when slid out to it's furthest point. Odyssey does not recommend storing your laptop inside the case.